Learn to look critically at everything. Determining the quality of your resources is ultimately your responsibility, so if you have any doubts (and you should often doubt!) investigate it further. Some criteria are essential to consider for all types of sources you consider using. 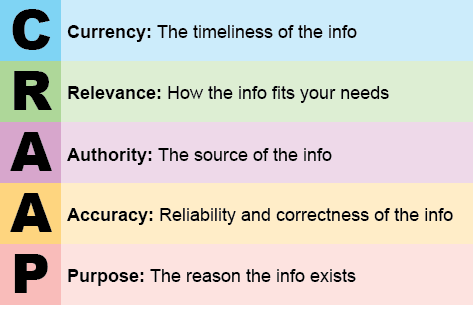 These include CURRENCY, RELEVANCE, AUTHORITY, ACCURACY, and PURPOSE. See their respective tabs above for information about these criteria. Other criteria are directly related to the type of source you're examining. For help on evaluating the quality and usability of a potential source, be sure to also look at the subtabs under SOURCE TYPE (BOOKS, ARTICLES, etc.). Back in the print days, it was easy to figure out whether the thing you had in your hand was a book, a magazine, a newspaper, and so on. Now, when most of the text we read is electronic, it can be hard to determine what you're actually looking at. But many print sources have just been translated to an online format - they still maintain the key characteristics of their original publication type. All of the SOURCE TYPE subtabs have information about how to figure out whether the thing you're looking at is in that category.